In about 20 days from now, the city of San Francisco will see thousands of knowledge-hungry Mac and iOS developers arriving from all parts of the globe to attend the WWDC, Apple's annual developer event that this year officially kicks off on June 6. With Apple showcasing the next version of iOS and Mac OS X Lion on stage, plus other cloud-related services we've heard about in the past weeks, there's the chance this year's WWDC is going to be one of those to be remembered for years to come. Not to mention the Apple Design Awards, for the first time counting both Mac and iOS applications that provided an example of excellence and developer craftsmanship throughout the past months of App Store availability. I've never been to WWDC, but I have a pretty solid feeling it's not just about Steve Jobs, Forstall's perennial surprised face, Cocoa and sessions. From what I hear, there are some wild parties and dinners going down in San Francisco during the WWDC. After all, those tired developers deserve some fun after a day of CoreAnimation training and ADAs tension, right? 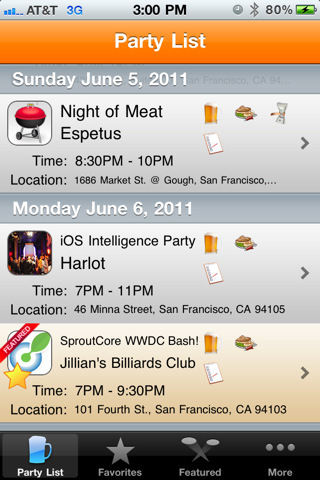 Meet Party List, a free iPhone app that everyone who's going to WWDC this year should download. The app? It basically gives you a list of "all the hippest, kewlest, craziest, and down right awesomest parties" happening during WWDC. Then, you save a party to your favorites and you go there -- simple. To promote and event you're organizing, just get in touch with the developers and ask them to include it in the app. That's it. Party List is free -- attending the WWDC, of course, is not. I won't be in San Francisco to record my experiences with developers, parties and drinks with Scott Forstall, but if I could come, I'd certainly put Party List on my homescreen. The app even supports push notifications -- now, here's something I wish Apple will fix come June 6.